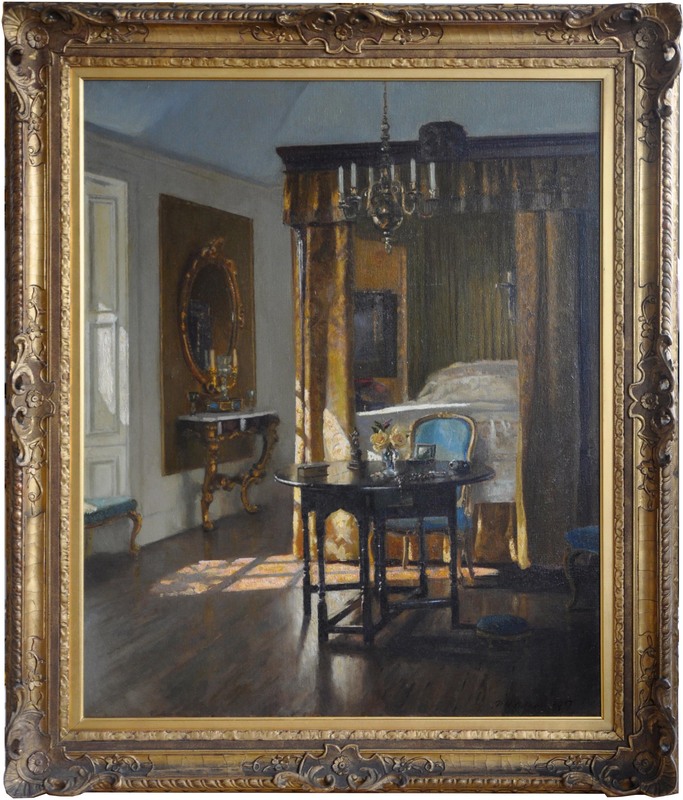 An original oil on canvas which was exhibited at The Royal Academy in 1917 and The Royal Scottish Academy in 1918. 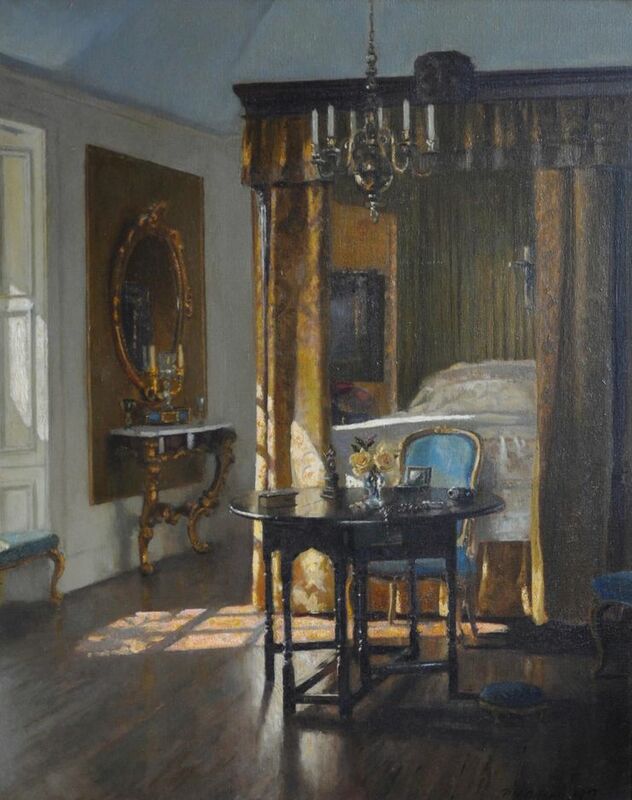 It was painted by the Scottish artist Patrick William Adam RSA, a still life interior of a bedroom for which he became most famous. An absolutely stunning painting with warm yellow hues of the drapes and flowers and the light through the window casting a warm glow. Original gallery exhibition frame. 50 inch by 40 inch. Gallery condition. Patrick William Adam RSA (1852-1929) - born in Edinburgh 12 October 1852 to Patrick Adam, a writer, and Louisa Roberts, Patrick William Adam exhibited an early talent for art. He began classes at the RSA in 1874 and studied under William McTaggart and GP Chalmers. Some of his work of that period is in the East Lothian collection: the then curriculum involved intensive study of ‘Old Masters’ – and the production of copies in the Masters’ styles. Adam won the Stuart prize for Life Drawing in 1877, by which time he had already been exhibiting at the RSA for several years He travelled to Rome, Venice and Russia and produced work in several media – watercolour, pastel and (principally) oil; subjects varied from landscapes through portraits to still life but his genre paintings and interiors were reckoned his best work. Much of this was (recognisably) produced from his studio at Ardilea, North Berwick, where he settled in 1908. In 1912 he became a founder member of the Society of Eight, a group of friends who exhibited for many years at the New Gallery in Shandwick Place, Edinburgh. Others in the original group were David Alison, FCB Cadell, John Lavery, Samuel Peploe and James Paterson. More, including Duncan Grant, William MacTaggart and William Gillies were later participants. Their aim was to bridge a perceived Glasgow-Edinburgh divide; the onset of war in 1939 seems to have ended the society. Adam died at his house, Ardilea in North Berwick, on 27 December 1929 and was buried at North Berwick. Adam was elected ARSA in 1883 and RSA in 1897. His work is in several public collections.